Double Colored Speicial Op's division Ribbons (800's Divisions) are done with black ribbon on top and yellow/gold ribbon behind the black with gold letters and accents. 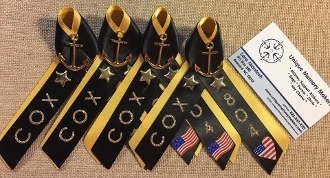 These ribbons are a great way to show support for your Sailor and let them know how proud you are of their accomplishment. They make it easy to recognize other families who have Sailors in your Division and they make a wonderful keepsake. Great for wearing to PIR/Graduation and the Meet and Greet. Each ribbon is handmade to your specifications. Your Sailors last or first name is on the left and their division is on the right. There is a pin on the back of each ribbon so you can pin it to your shirt. Check this site for proud Mom/Dad etc ribbons also available in the Special Op's colors. FLAG Option: The American flag is added to each ribbon if the Sailor has other family members who are serving or have served in any branch of the military.